Participants in the ESL conference in Bergen. Professor Gissurarson (in blue jacket and red shirt) stand behind one of the girls who hold the ESL banner. Yaron Brook stands at the centre behind the banner. The much-discussed theories of French economist Thomas Piketty are not based on sound principles, as can be seen on a close scrutiny. This was what Professor Hannes H. Gissurarson, RNH Academic Director, argued at the conference of European Students for Liberty in Bergen 10 October 2014. Professor Gissurarson contrasted Piketty with Rawls, the main leftwing thinker of the past: Whereas Rawls was preoccupied with the poor, Piketty seems solely to be concerned with the rich. Everybody agrees that poverty is a problem. But is affluence really a problem? But even if Piketty’s use of the data could be plausibly criticized, as has been the case, it could well be, Professor Gissurarson submitted, that the gap between the poorest and the richest groups in the West had widened somewhat in the last few decades (mainly because the richest have become much richer, the gap has been stretched upwards). But income distribution in the world as a whole had in fact become more even (mostly because many of the poor in China and India have produced themselves out of poverty; according to figures from Piketty’s own data base the real income of the poorest 90% in China has tripled since the mid-1980s). 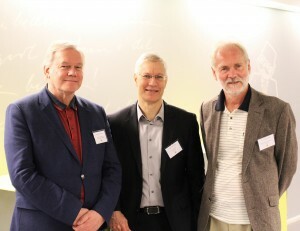 Three speakers: Gissurarson, Brook and Hannesson. Photo Eszter Nova. Professor Gissurarson asked: Is something wrong with this trend? Should it not be welcomed that hundreds of millions of people in China and India have escaped poverty by their own efforts? It was however correct that some people in the West possessing marketable, but unique, irreproducible and unimitable skills and abilities, such as film stars, entertainers, athletes, innovators and entrepreneurs, now could because of globalisation reach a much larger market than before, possibly three to four billion people instead of only 300–400 million in the past; this resulted in them gaining a much higher income (which would constitute rent in the sense of economics). But there was nothing wrong with income distribution by choice, Professor Gissurarson maintained. He gave a simple example: Milton Friedman visits Iceland to give a lecture. A thousand people attend the lecture, each paying an entrance fee of $50. Thus, Friedman becomes richer by $50,000, and 1,000 people become poorer each by $50. But where is the injustice? Everybody is satisfied. Professor Gissurarson also pointed out that capital was not made of the same solid and immobile material as Piketty seemed to think. Piketty frequently quoted Balzac’s novels. But the main theme in most of these novels was how fragile and fickle wealth could indeed be. For example, in Balzac’s famous Old Goriot (Père Goriot), often quoted by Piketty, Goriot himself, previously wealthy, has run out of money. One of his daughters was struggling to pay the gambling debts of her secret lover, while the husband of the other one had lost the dowry in speculations. Five Icelandic students attended the Bergen conference. The other speakers were activist Rasmus Brygger from Denmark, Dr. Yaron Brook from the Ayn Rand Institute, and Professor Emeritus Rognvaldur Hannesson from the Norwegian Business School in Bergen, NHH, which was the venue of the conference. Professor Hannesson, an Icelander who has spent all his professional career in Norway, is also a Visiting Professor at the University of Iceland. The organisation was in the hands of Eirik Aaserod from Norway and Lukas Schweiger, ESL chairman. Professor Gissurarson’s lecture formed a part of the joint project by RNH and AECR on „Europe, Iceland and the Future of Capitalism”.